Every home is unique. If you want to attract your ideal buyer, you need to showcase your property with the right eye-catching real estate flyers. Whether you’re trying to drive traffic to your open house or inform potential buyers about your listing, check out the 25 best real estate flyers for 2018. 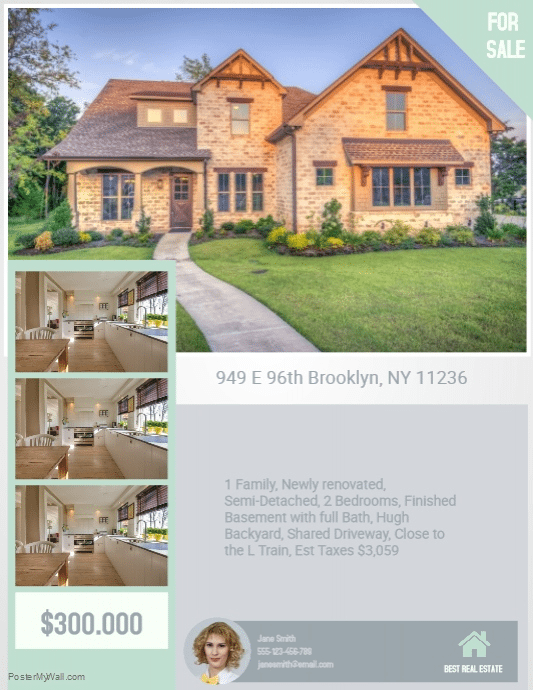 We created a flyer below which you can download for free and edit to match your listing. 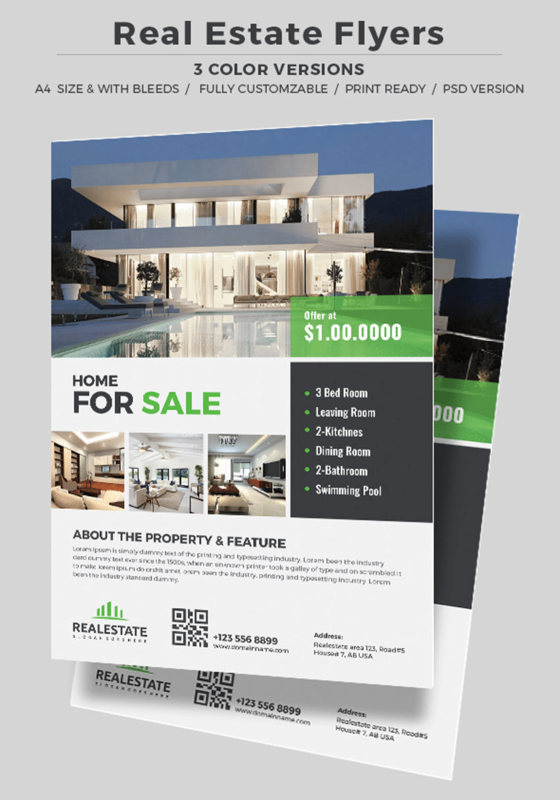 You can also check out other flyer templates at ProspectsPLUS!®, a company that specializes in real estate marketing materials and offers a number of top-notch flyers for real estate agents. To access these free templates, simply login or create an account with ProspectsPLUS!® to see all the templates and customize them for your event or listing. Just make sure you choose “PDF Download Only” to get the free template. Once you confirm your final proof, add the template to your cart. 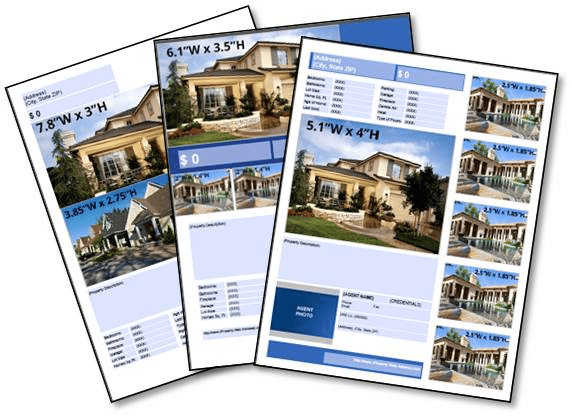 Zillow is an all-around real estate services platform that offers real estate flyer templates. Each free template is simple to customize and easy to edit. There’s no need to worry about page layout, font selection, or scaling of photos—just add your photos, property details, and contact information. You can then print your listing flyers using your own printer, take them to a professional printer, or send them as an embedded image within your emails. 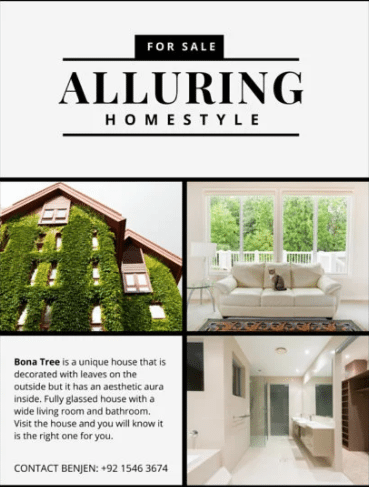 Canva’s Alluring Homestyle flyer is a stylish option that fits equally well on a minimalist website or a top-tier home magazine. Not only can you easily drag and drop your best listing photos into the grid, you can play around with the typography or add some texture to the background. Once the template images are completely personalized, just add your listing description and your flyer is ready to publish. 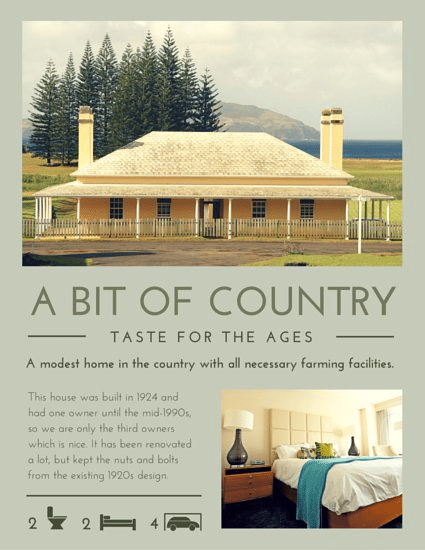 The Cottage House flyer template is a great way to showcase a beautiful countryside manor or a delightful refurbished farmhouse. Like Canva’s other templates, you can highlight your quality listing photos and features using visually appealing fonts and colors to achieve the exact look you want. 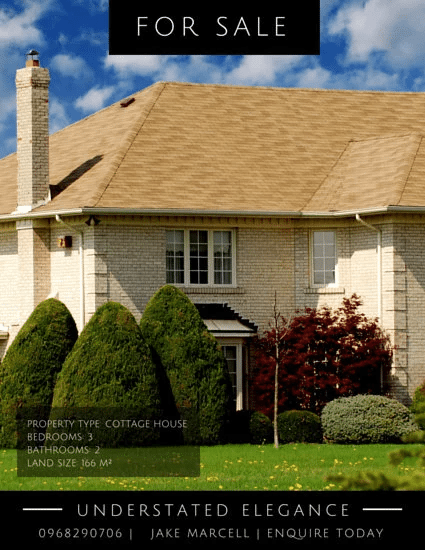 This template focuses on one large photo, making this a great option for houses with impressive curb appeal. 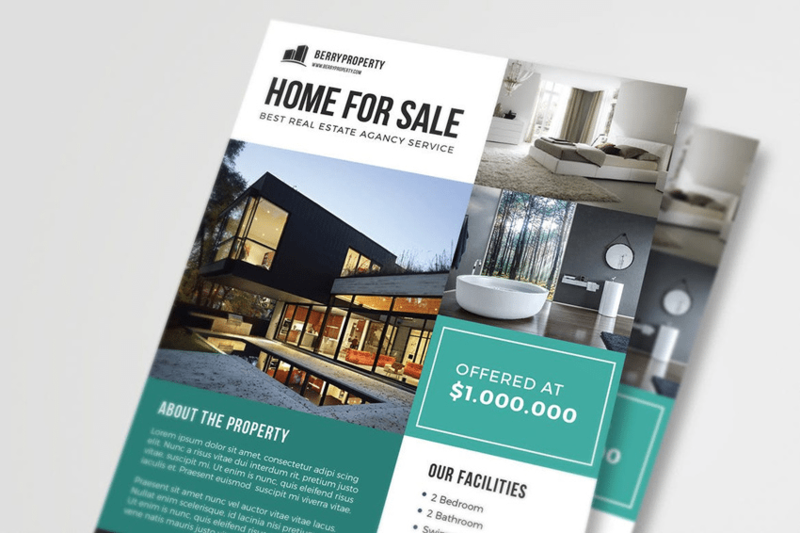 Whether you’re trying to drive traffic to your open house or inform potential buyers about your listing, these flyer templates will get you there. This simple but elegant template is a beautiful way to highlight the features of a traditional or transitional style home. The template has four photo boxes to display and promote the best parts of your home and includes icons to clearly identify important features like bedrooms, bathrooms, and garage size. It also provides a large space for marketing text and an attention-grabbing headline. The Envato Real Estate Business flyer features a great circular design with room for listing photos, company details, agent contacts, and property information. Not only are Envato’s templates easy to use, the platform includes a help file to make it even easier to edit any of its flyers’ text or design elements. 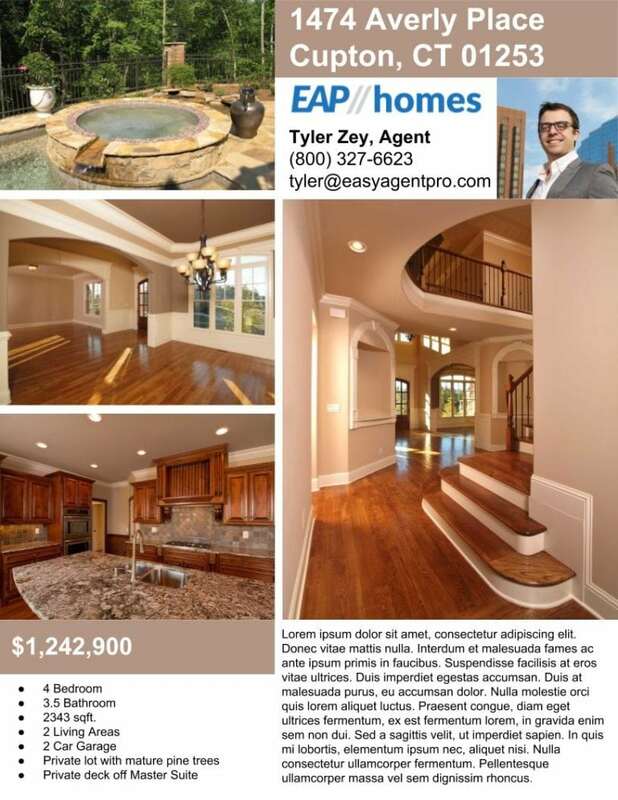 This template has a lot of space for listing details and agent contact information, so it’s a great option if you want to highlight multiple properties on one flyer. 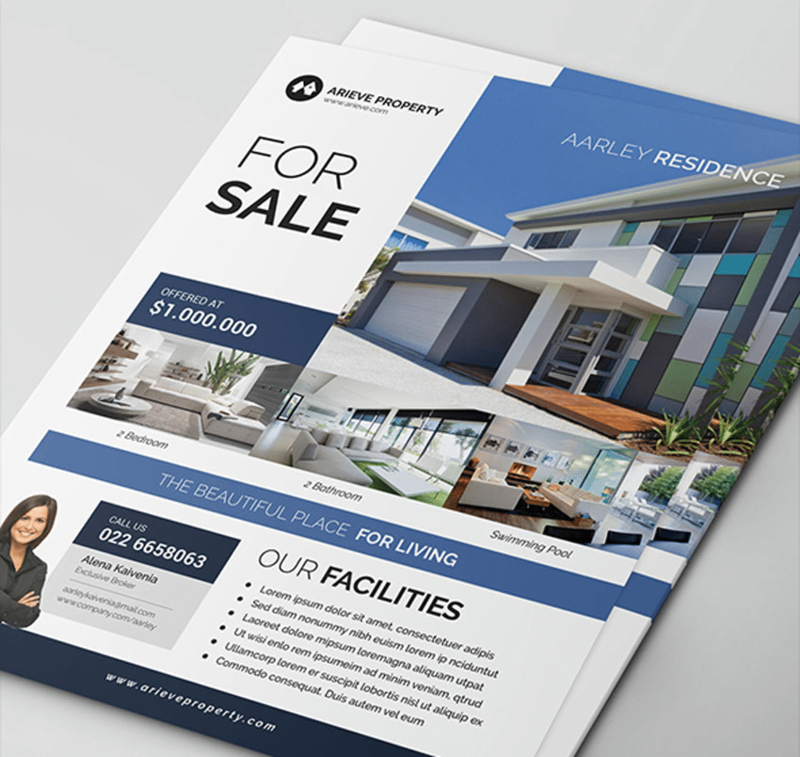 Like Envato’s other real estate templates, this flyer design looks sleek and professional. 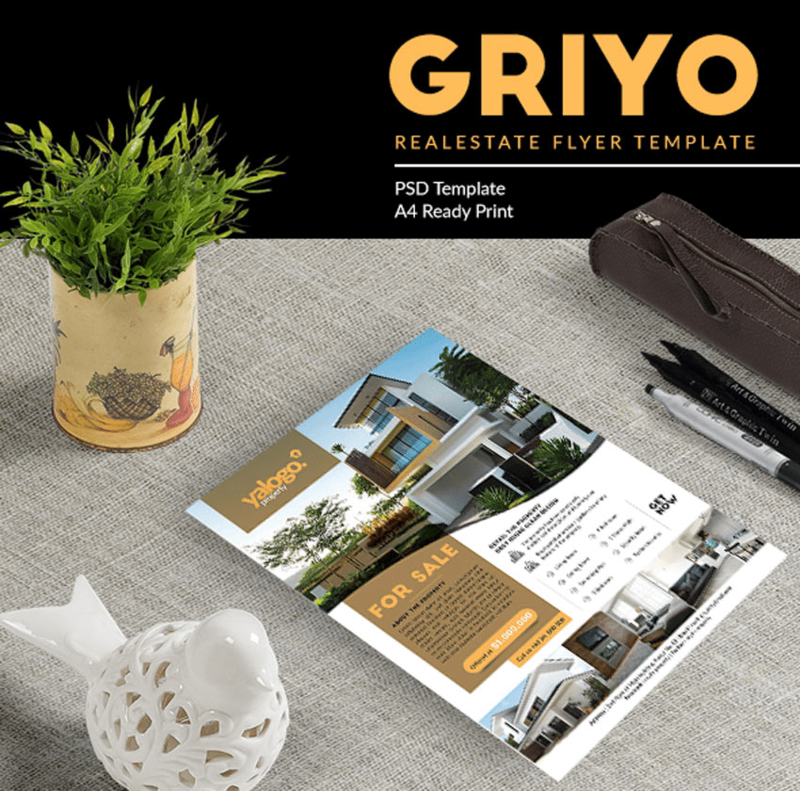 The Griyo template features a print-ready design created in A4 format, with four photo placeholders you can easily modify with your own images. The Griyo template is best suited to a single listing and has space to feature your agency logo, an informative property description, and listing stats. This stunning flyer design features a clean, minimalist theme with three unique layouts to choose from. Available in both Photoshop and Illustrator formats, this works perfectly in standard design software. While individual Envato templates cost $5 to $10 and up, if you subscribe, you can unlock this and 40,000+ other graphic items. This template makes an impact with its tasteful use of contrast through bold typography and a clean layout. 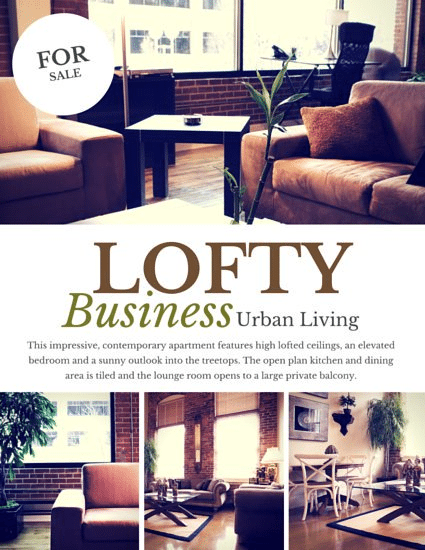 Canva’s template can help your real estate flyer look practical, pretty, and professional all at the same time. Just add four amazing photos plus the benefits and features of your property, and finish it off with your own branding for a personal, unique appearance. There are many flyer templates that cater to urban properties, but only a few good ones for selling a property in a rural location. This beautiful, rustic template is one of them. It reminds homebuyers of everything that’s good about the country and sells a lifestyle with simplicity, peace, quiet, and calmness. 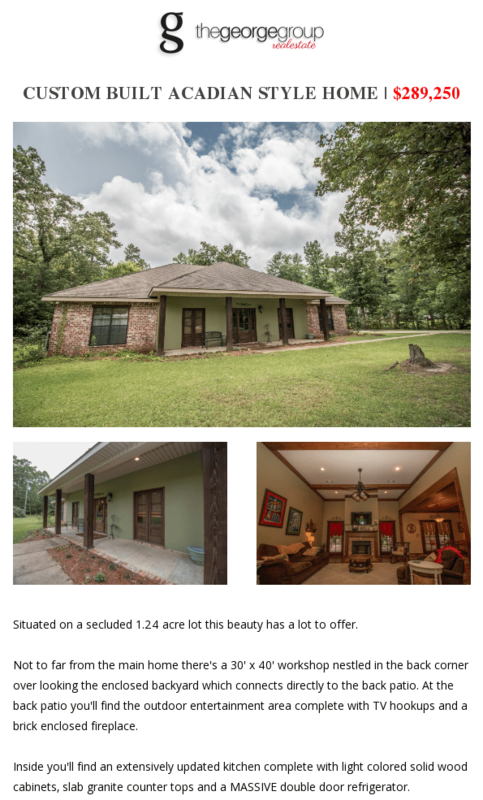 This is a great template for showcasing one stunning, high-impact photo of your listing. More than half of the flyer template is allocated for a photo of the house, so it’s a great option for houses with great curb appeal and straightforward listing details. Plus, you and your agents can optimize this image using Canva’s integrated photo editing tools to ensure you’re making the best possible impression. This colorful flyer is ideal for commercial companies and features a bold design with stylish details and fully editable layers. 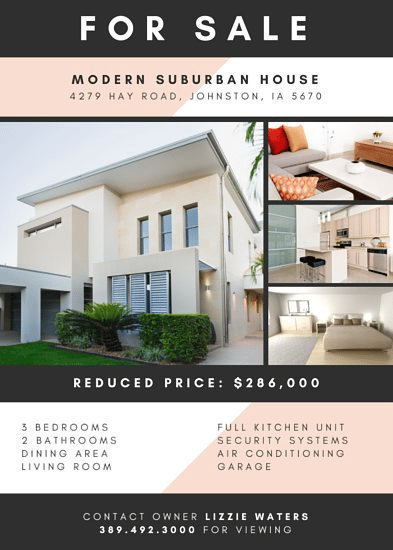 Grab your prospect’s attention with this winning flyer design, which includes space for a listing photo and extensive property details. 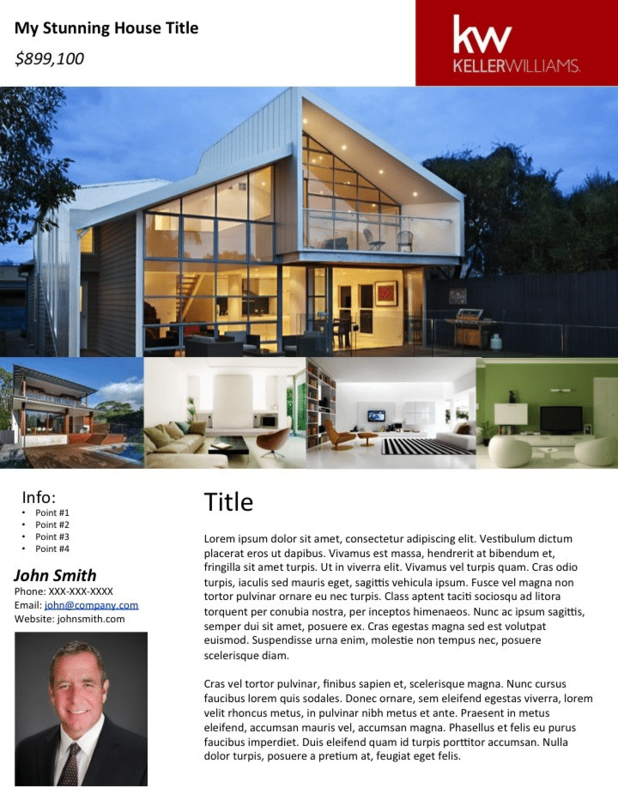 This is a beautifully simple, two-page flyer template to showcase the features of any house. The document has a sleek, modern style with plenty of white space to highlight listing details, agent contact information, and more. This stunning template is simple and attractive and lets potential homebuyers focus on the property without being distracted by flashy graphics. 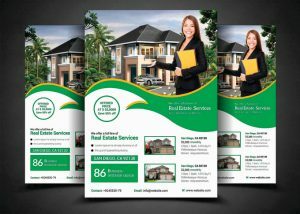 These flyer templates are an ideal way to create a cohesive marketing suite for your real estate agency and specific listings. The set of flyers features designs created in A4 format that are compatible with all Adobe Illustrator CS versions. Plus, when you download the file, you can utilize three creative versions, making it easy to personalize your marketing materials. This template is designed to stand out with its soft, modern color palette. The layout allows you to use the photo grid to distinctly feature the home’s exterior and keys parts of the interior: the living room, the kitchen, and the bedroom. What’s more, the standard font is both attractive and readable, making it the perfect addition to a sophisticated branding scheme. 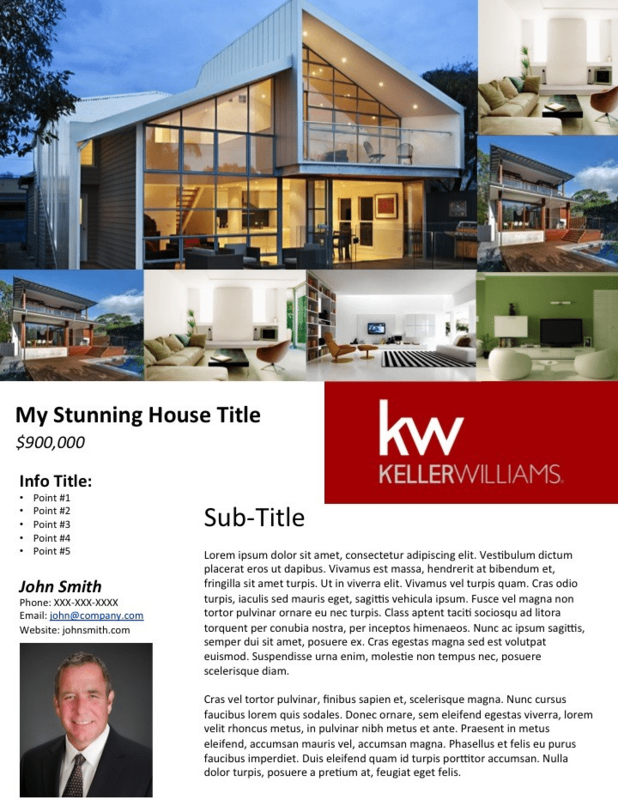 This striking template features a clean, modern design with plenty of room to highlight your listing’s most important information. 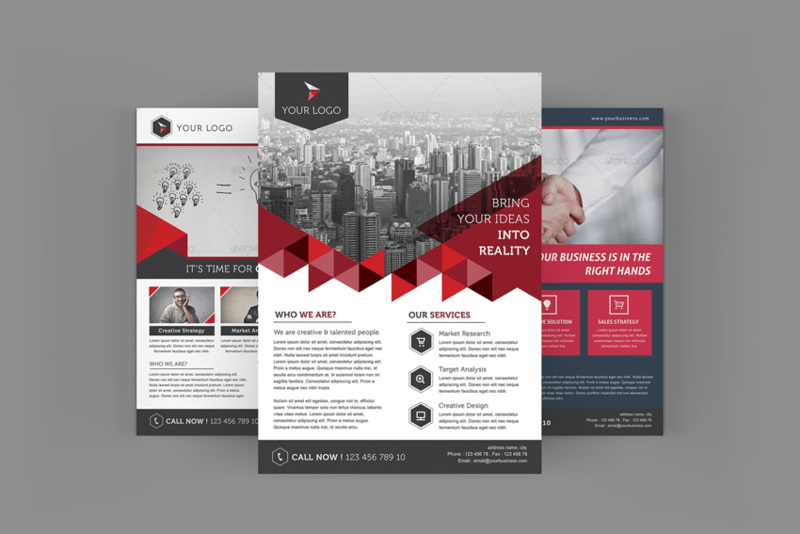 You can select from three distinct color versions, making it an easy way to create unique flyers that can be combined to create a cohesive marketing scheme. The contrast of light and dark makes it look clean, professional, and easy to read. This is an elegant, premium suite of flyers that has an air of sophistication and features a minimalist theme with eight Photoshop files. You can let this flyer do all the selling for you as it is one of the most beautiful designs we have seen and offers a great deal of design flexibility. Not only is it easy for beginners to customize, the various formats allow you to create several different documents to diversify your marketing materials. 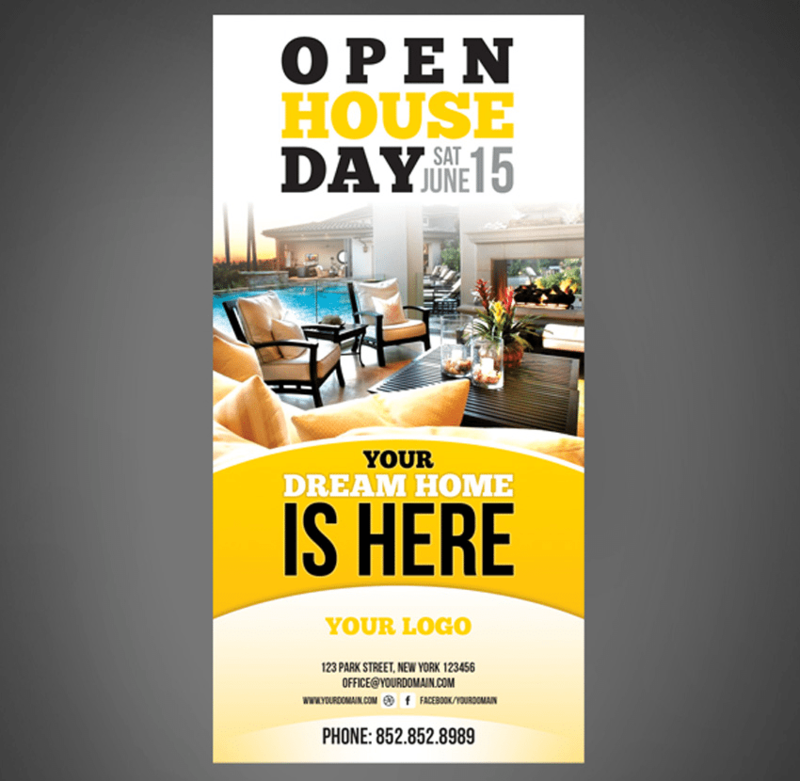 This stylish and eye-catching flyer is ideal for any open house. It has a vibrant and sophisticated design that’s simple and straight to the point, and it’s unique dimensions will draw the attention of potential homebuyers. Plus, you can choose from four different color schemes to fit your style and easily edit the tagline and property details to make it both informative and attractive. This real estate flyer is a perfect match for your business because of its clean, professional design and high-resolution format. 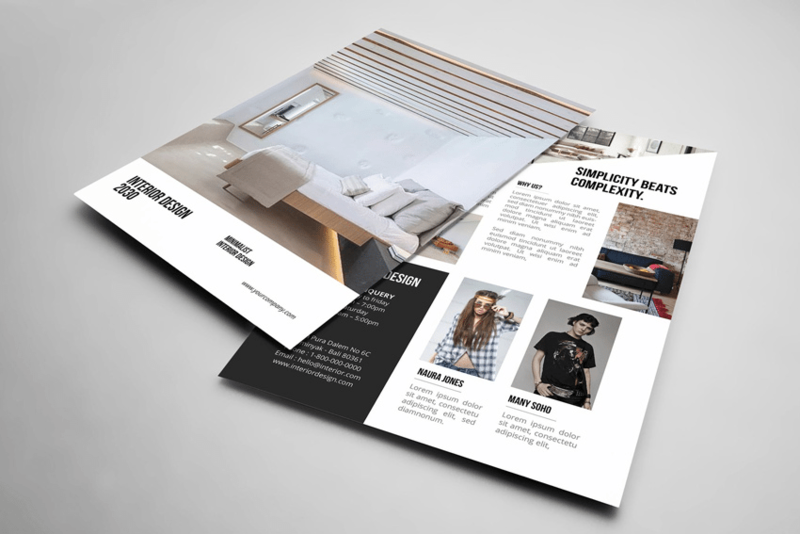 The Adobe InDesign template is print-ready for immediate use and can be personalized with listing photos, information about your agency and team members, or both. Try this template if you want to include a lot of property details in your flyer without having to focus on actual listing photos. 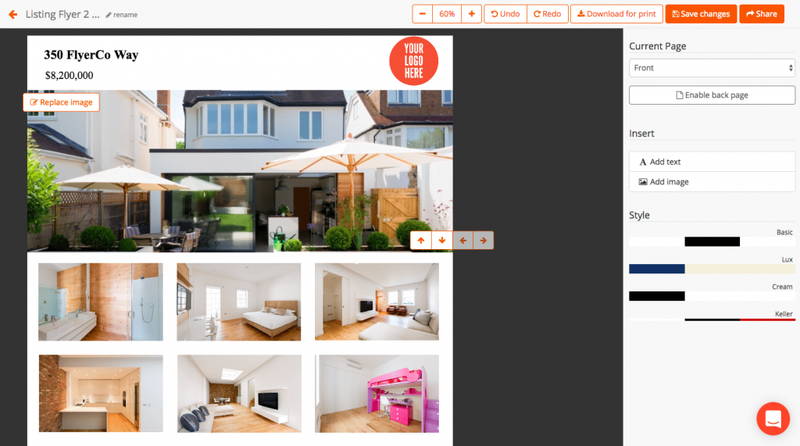 PosterMyWall allows you to create amazing flyers online without the use of any software. You can download this template for free if you’re willing to include the PosterMyWall watermark and don’t need high-quality prints. Alternatively, the download just costs $2.99 or $7.99, depending on the image quality you want. Plus, PosterMyWall’s templates were created by different designers, so there is enough variety to meet the needs of any agent, team, or brokerage. Like PosterMyWall, FlyerCo allows you to create beautiful real estate flyers that you can download, print, and share without using any software. A single flyer design costs $19.99. However, FlyerCo has subscription plans that integrate a lead capture system and allows you to create an unlimited number of flyers for $9.99 monthly or $49.99 annually. Easy Agent Pro’s Big Hero template helps agents attract buyers by including a ton of great pictures of your listing. In addition to highlighting a great picture of the exterior of your house, you can include an additional six images on the sides. Because the template is very flexible, it’s a great option for most houses, but it’s important to use high-quality images that will really make the template pop. Like Easy Agent Pro’s Big Hero template, this option lets you create flyers that highlight the beautiful curb appeal of your house. Place a huge image at the top of your flyer and include four additional images to ensure buyers have a hard time forgetting your property. This is the perfect flyer template for houses that not only have a beautiful exterior but also feature eye-catching interior designs with an appealing color palette. This flyer works best for houses that have a not-so-great curbside appeal. The template lets you highlight the other features of the house, like the interior or back yard, without drawing a homebuyer’s focus to the less enticing parts of your listing. Plus, there is plenty of room to include details about the property and surrounding neighborhood so you can let the house’s strengths shine. 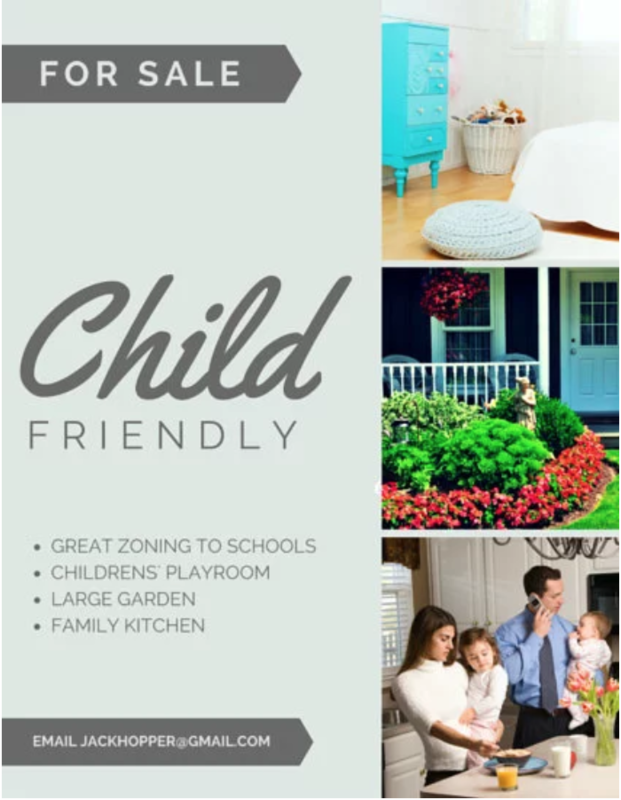 This simple template highlights all of the things that make a home excellent for families with children. Not only does the flyer feature three images from your listing, you can include details about the property’s neighborhood, school district, yard, and more. Plus, the flyer’s simple appearance makes it easy to focus on the property’s strengths. The cost of real estate flyers depends on the necessary editing software, your printing methods, and your preferred paper quality. Expect to pay between $0.20 and $0.52 per flyer plus design costs. 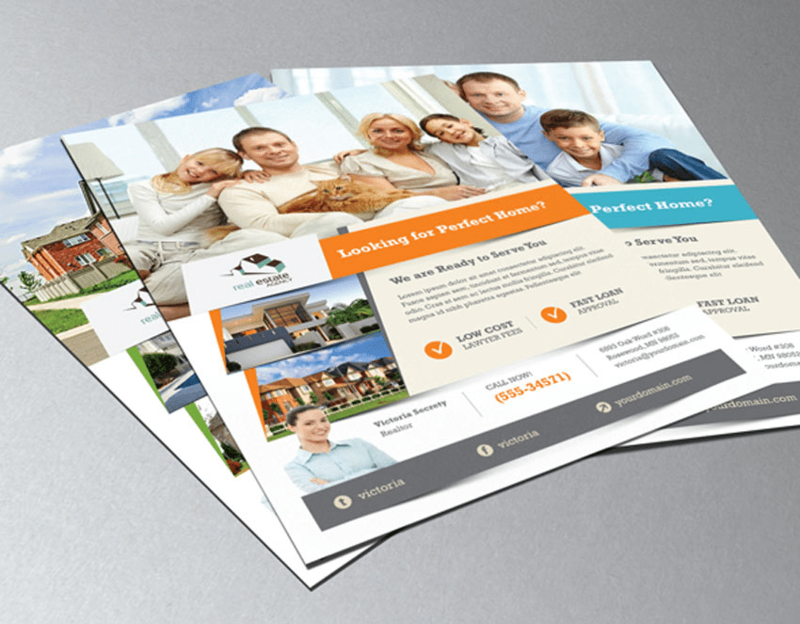 Plus, using a free real estate flyer template is a great way to save money on listing promotions. Print them yourself – On average, a ream of paper costs between $5 and $10, and the cost of cartridges for an inkjet printer varies. Hire a printing company – If you want to design your own flyers but don’t have in-house printing capabilities, try Vistaprint. Expect to pay around $100 to $200 for 500 high-quality flyers. 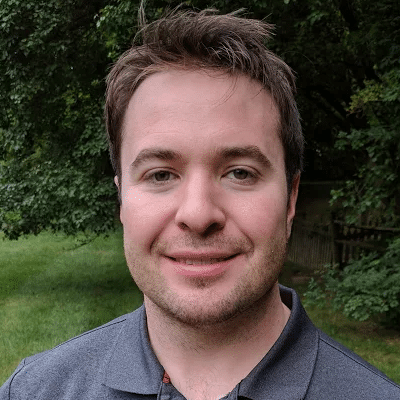 Use ProspectsPLUS! – If you’re using ProspectsPLUS!®, flyers generally cost $0.24 to $0.42 for #70 matte paper and $0.32 to $0.52 for #100 gloss paper. You can also get a discount based on volume. Hire a graphic designer – Even if you don’t have a large budget, you can hire a graphic designer on Fiverr for as little as $5. This way, you can use Envato flyer templates without having to invest in expensive software like Adobe InDesign. Most of the templates we included in our list can be edited using an online platform or with basic editing software like Adobe PDF. However, some require more advanced software like Adobe InDesign, which can be purchased online. Regardless of your software, the editing process is generally the same. Select a design – Choose a design that will highlight the strengths of your listing while drawing a buyer’s eye away from the property’s quirks. Customize it – Make your flyer unique by adding text, uploading your own images, and changing the font style. Include your company branding – Always include your logo, agent details, and contact information so buyers know exactly who to contact. This is especially important for homebuyers who aren’t represented by an agent. For most realtors, however, it will be easier to work with a printing company. We recommend ProspectsPLUS!®, which specializes in marketing for realtors. Use their templates to customize your brochure today; just be sure to use high-quality photos for the most eye-catching flyers. Designing completely custom flyers can be expensive. 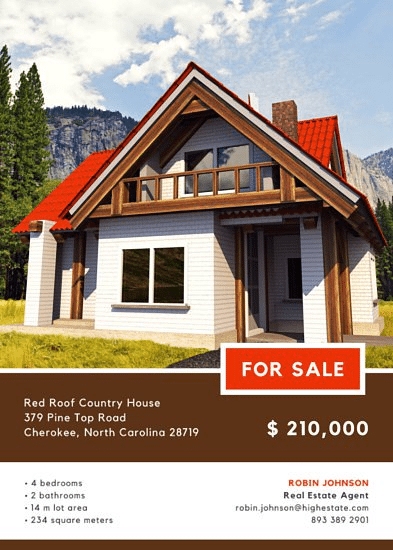 Using a real estate flyer template to create promotional materials is an affordable and simple way to simplify the design process and share important listing information with potential buyers. However, there are some drawbacks, like limited design flexibility, that make templates less than ideal for some agents. Easy to use – Creating a real estate flyer with a template is easier than learning how to use editing software and creating flyers from scratch. Free or inexpensive – Many templates are relatively inexpensive or even free, and don’t require you to purchase expensive editing software. Flexible design – Some of the more advanced template options allow you to completely customize your flyers rather than work within a restrictive format. High quality – You can achieve higher quality flyer layouts and designs using templates than by creating a simple flyer in basic word processing software. Less design flexibility – Using a template instead of using more advanced editing tools means you can’t always move text boxes and images in a way that best suits your listings. 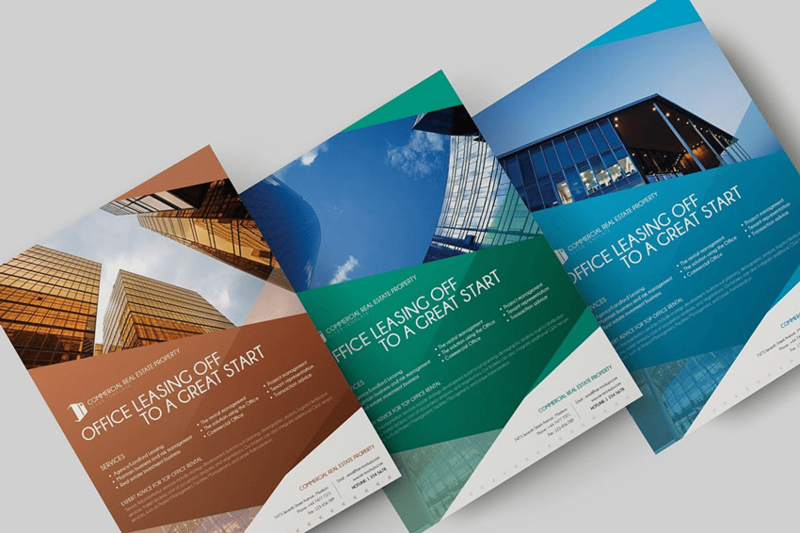 Not unique – Templates are easy to use and cut down on the time your agents have to spend creating promotional materials. However, other agents have access to the same templates, so your marketing flyers will not be truly unique. Difficult to edit – Some templates can only be edited with editing software like InDesign. 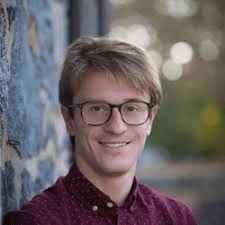 There is a steep learning curve for these more advanced editing software platforms, so you may want to use a template that can be personalized with an online platform. Using flyer templates is an effective way to promote your agency and listings online, at open houses, and in your farm area. We asked experienced realtors how to maximize the impact of your flyers with the best software and content. In general, they suggested creating branded flyers and incorporating them into a comprehensive marketing strategy. This template [below] has been one of my favorites. Not only because it’s easy to use but also because it’s generated sales just by getting it in front of the right client. I used Canva to create all the image inserts, logo, header, and footer. I collect inquiries directly from Facebook lead ads, push them to my Mailchimp using Zapier, and respond with a welcome email along with additional onboarding emails the first week of signup, all through Mailchimp. I use Mailchimp because it’s free and by far the easiest template creator I’ve come across. I use the email template attached, over and over. I’ll change the images out for new listings, update the information, replace the videos and send it out to my database when we get new listings or when I see a new listing to the market I think my database might be interested in. Perfect example: an email is sent out showcasing a new listing in a desired area. 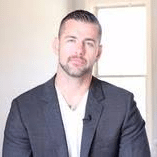 A client on my database responds back by clicking the CTA within the email, we set up a showing, they love the home, and we make an offer to purchase the next day. I believe that as long as you are in touch with what your database wants, you’ll always be successful. You just have to keep giving them what they want as often as possible. Infographic software is a great way to produce custom, DIY flyers. The drag-and-drop capabilities are easy to use and surprisingly flexible. We personally use Piktochart to create our in-house marketing flyers. I rarely utilize templates for flyers. Each listing or campaign requires specific copy. The objective is to educe memories or emotion. 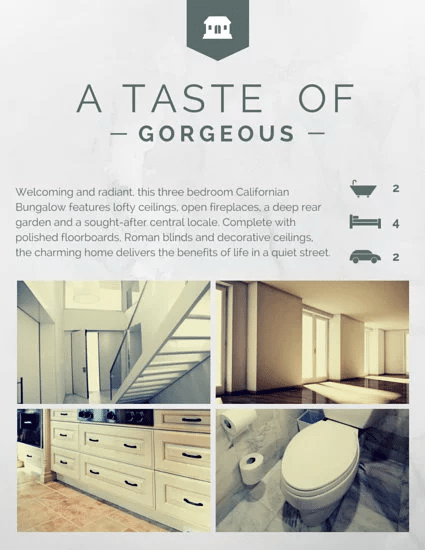 Visual cues highlight the specific property supported by strong copywriting to increase ROI. Real estate flyers can be posted on your website and social media, provided at open houses, or shared with your community. 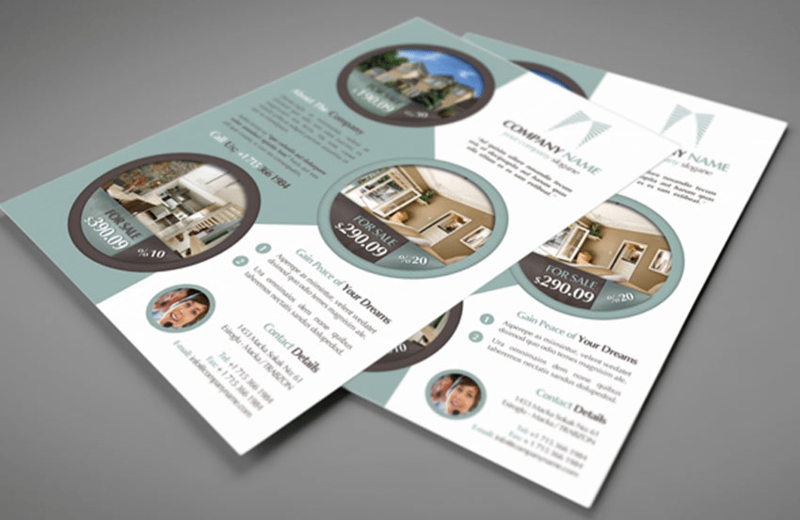 Optimize your flyer by choosing a template that highlights the best parts of your property. Then, use the template to showcase your property with high-quality listing photos, property details, and agent information.